Want to shoot reduced loads without adding a filler? Want to lose the hassle of using a second insert to seat your balls? Want a faster in-frame loading system? Just announced by TK4B Enterprises, LLC. 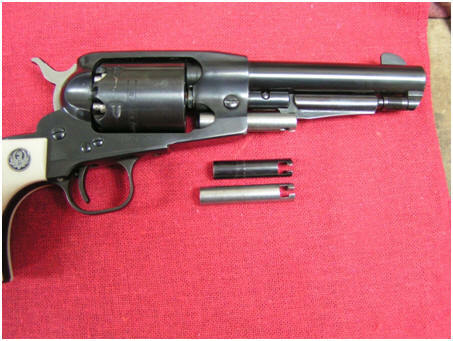 is a newly designed and easily replaceable loading ram for Ruger Old Army black powder pistols. The SliX-Ram is designed at .340” longer than the original. This added dimension allows the shooter to reload their cylinders with reduced powder charges without having to add filler or use a secondary insert to fully seat the ball. Obviously, looking at the picture below, it will be more difficult to seat conicals. Shooters who have tested the extended ram have reported being able to use powder charges as low as 24 grains without a filler, and with a much better sense of convenience. As you can see from the picture above, it is a simple installation. Merely replace the SliX-Ram during and cleaning operation, or just exchange it at any time. They come only in the white and therefore may require more care during cleaning and maintenance. The manufacturers want to clearly point out that if you have little or no idea how these rams are supposed to fit and work, get help or find someone who does know how to install them. These Rams are about as close as we have come to a “Drop-In” unit, just take care during installation.